The Gulf Stream, together with its northern extension the North Atlantic Drift, is a warm and swift Atlantic ocean current that originates in the Gulf of Mexico and stretches to the tip of Florida, and follows the eastern coastlines of the United States and Newfoundland before crossing the Atlantic Ocean. The process of western intensification causes the Gulf Stream to be a northward accelerating current off the east coast of North America. At about 40°0′N 30°0′W﻿ / ﻿40.000°N 30.000°W﻿ / 40.000; -30.000, it splits in two, with the northern stream, the North Atlantic Drift, crossing to Northern Europe and the southern stream, the Canary Current, recirculating off West Africa. Franklin asked Timothy Folger, his cousin twice removed (Nantucket Historical Society), a Nantucket Island whaling captain, for an answer. Folger explained that merchant ships routinely crossed the then-unnamed Gulf Stream—identifying it by whale behavior, measurement of the water's temperature, and changes in the water's color—while the mail packet captains ran against it. Franklin had Folger sketch the path of the Gulf Stream on an old chart of the Atlantic and add written notes on how to avoid the Stream when sailing from England to America. Franklin then forwarded the chart to Anthony Todd, secretary of the British Post Office. Franklin's Gulf Stream chart was printed in 1769 in London, but it was mostly ignored by British sea captains. A copy of the chart was printed in Paris circa 1770–1773, and a third version was published by Franklin in Philadelphia in 1786. The inset in the upper left part of the 1786 chart is an illustration of the migration pattern of herring and not an ocean current. Because of conservation of potential vorticity caused by the northward-moving winds on the subtropical ridge's western periphery and the increased relative vorticity of northward moving water, transport is balanced by a narrow, accelerating poleward current. This flows along the western boundary of the ocean basin, outweighing the effects of friction with the western boundary current, and is known as the Labrador current. The conservation of potential vorticity also causes bends along the Gulf Stream, which occasionally break off due to a shift in the Gulf Stream's position, forming separate warm and cold eddies. This overall process, known as western intensification, causes currents on the western boundary of an ocean basin, such as the Gulf Stream, to be stronger than those on the eastern boundary. In April 2018, two studies published in Nature  found the Gulf Stream to be at its weakest for at least 1,600 years. Hurricane Sandy intensifying along the axis of the Gulf Stream in 2012. 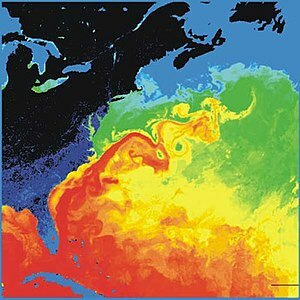 The warm water and temperature contrast along the edge of the Gulf Stream often increase the intensity of cyclones, tropical or otherwise. Tropical cyclone generation normally requires water temperatures in excess of 26.5 °C (79.7 °F). Tropical cyclone formation is common over the Gulf Stream, especially in the month of July. Storms travel westward through the Caribbean and then either move in a northward direction and curve toward the eastern coast of the United States or stay on a north-westward track and enter the Gulf of Mexico. Such storms have the potential to create strong winds and extensive damage to the United States' Southeast Coastal Areas. 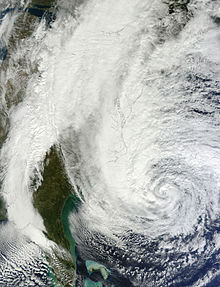 Hurricane Sandy in 2012 was a recent example of a hurricane passing over the Gulf Stream and gaining strength. Strong extratropical cyclones have been shown to deepen significantly along a shallow frontal zone, forced by the Gulf Stream itself, during the cold season. Subtropical cyclones also tend to generate near the Gulf Stream. 75 percent of such systems documented between 1951 and 2000 formed near this warm water current, with two annual peaks of activity occurring during the months of May and October. Cyclones within the ocean form under the Gulf Stream, extending as deep as 3,500 metres (11,500 ft) beneath the ocean's surface. The theoretical maximum energy dissipation from the Gulf Stream by turbines is in the range of 20–60 GW. One suggestion, which could theoretically supply power comparable to several nuclear power plants, would deploy a field of underwater turbines placed 300 meters (980 ft) under the center of the core of the Gulf Stream. Ocean thermal energy could also be harnessed to produce electricity using the temperature difference between cold deep water and warm surface water. ^ Fernandez-Armesto, Felipe (2006). Pathfinders: A Global History of Exploration. W. W. Norton & Company. p. 194. ISBN 978-0-393-06259-5. ^ a b c Tuchman, Barbara W. The First Salute: A View of the American Revolution New York: Ballantine Books, 1988. pp.221–222. ^ Isserman, Maurice (2002). "Ben Franklin and the Gulf Stream" (PDF). Study of place. TERC. Retrieved 15 July 2010. ^ Anon. "1785: Benjamin Franklin's 'Sundry Maritime Observations'". Ocean Explorer: Readings for ocean explorers. NOAA Office of Ocean Exploration and Research. Archived from the original on 18 December 2005. Retrieved 15 July 2010. ^ Richardson, Philip L.; Adams, Nathan T. (Spring 2018). "Uncharted Waters: Nantucket Whalers and the Franklin-Folger Chart of the Gulf Stream". Historic Nantucket. 68 (1): 17–24. ^ a b Barbie Bischof; Arthur J. Mariano; Edward H. Ryan (2003). "The North Atlantic Drift Current". The National Oceanographic Partnership Program. Retrieved 2008-09-10. ^ Elizabeth Rowe; Arthur J. Mariano; Edward H. Ryan. "The Antilles Current". Cooperative Institute for Marine and Atmospheric Studies. Retrieved 2009-01-06. ^ Matthias Tomczak and J. Stuart Godfrey (2001). Regional Oceanography: an Introduction. Matthias Tomczak, pp. 42. ISBN 81-7035-306-8. Retrieved on 2009-05-06. ^ Earthguide (2007). Lesson 6: Unraveling the Gulf Stream Puzzle - On a Warm Current Running North. University of California at San Diego. Retrieved on 2009-05-06. ^ Angela Colling (2001). Ocean Circulation. Butterworth-Heinemann. p. 96. ISBN 978-0-08-053794-8. ^ Maurice L. Schwartz (2006). Encyclopedia of Coastal Science. Springer Science & Business Media. p. 1037. Bibcode:2006ecs..book.....S. ISBN 978-1-4020-3880-8. ^ National Environmental Satellite, Data, and Information Service (2009). Investigating the Gulf Stream Archived 2010-05-03 at the Wayback Machine. North Carolina State University. Retrieved on 2009-05-06. ^ Joanna Gyory; Arthur J. Mariano; Edward H. Ryan. "The Gulf Stream". Cooperative Institute for Marine and Atmospheric Studies. Retrieved 2009-01-06. ^ Ryan Smith; Melicie Desflots; Sean White; Arthur J. Mariano; Edward H. Ryan. "The Antarctic CP Current". Cooperative Institute for Marine and Atmospheric Studies. Retrieved 2009-01-06. ^ Theuerkauf, Ethan J., et al. "Sea level anomalies exacerbate beach erosion". Geophysical Research Letters 41.14 (2014): 5139–5147. ^ Russel, Randy. "Thermohaline Ocean Circulation". University Corporation for Atmospheric Research. Retrieved 2009-01-06. ^ Edward and George William Blunt (1857). The American Coast Pilot. Edward and George William Blunt. Retrieved 2009-01-06. ^ Thornalley, David J. R.; Oppo, Delia W.; Ortega, Pablo; Robson, Jon I.; Brierley, Chris M.; Davis, Renee; Hall, Ian R.; Moffa-Sanchez, Paola; Rose, Neil L.; Spooner, Peter T.; Yashayaev, Igor; Keigwin, Lloyd D. (11 April 2018). "Anomalously weak Labrador Sea convection and Atlantic overturning during the past 150 years". Nature. 556 (7700): 227–230. Bibcode:2018Natur.556..227T. doi:10.1038/s41586-018-0007-4. ^ Caesar, L.; Rahmstorf, S.; Robinson, A.; Feulner, G.; Saba, V. (11 April 2018). "Observed fingerprint of a weakening Atlantic Ocean overturning circulation". Nature. 556 (7700): 191–196. Bibcode:2018Natur.556..191C. doi:10.1038/s41586-018-0006-5. ^ "Gulf Stream current at its weakest in 1,600 years, studies show". The Guardian. 12 April 2018. Retrieved 12 April 2018. ^ Geoff Samuels (2008). "Caribbean Mean SSTs and Winds". Cooperative Institute For Marine and Atmospheric Studies. Retrieved 2009-01-16. ^ Sarah Oktay. "Description of Nantucket Island". University of Massachusetts Boston. Retrieved 2009-01-06. ^ Professor Hennessy (1858). Report of the Annual Meeting: On the Influence of the Gulf-stream on the Climate of Ireland. Richard Taylor and William Francis. Retrieved 2009-01-06. ^ "Satellites Record Weakening North Atlantic Current Impact". NASA. Retrieved 2008-09-10. ^ Atlantic Oceanographic and Meteorological Laboratory, Hurricane Research Division. "Frequently Asked Questions: How do tropical cyclones form?". NOAA. Retrieved 2006-07-26. ^ S. Businger, T. M. Graziano, M. L. Kaplan, and R. A. Rozumalski. Cold-air cyclogenesis along the Gulf-Stream front: investigation of diabatic impacts on cyclone development, frontal structure, and track. Retrieved on 2008-09-21. ^ David M. Roth. P 1.43 A FIFTY YEAR HISTORY OF SUBTROPICAL CYCLONES. American Meteorological Society. Retrieved on 2008-09-21. ^ D. K. Savidge and J. M. Bane. Cyclogenesis in the deep ocean beneath the Gulf Stream. 1. Description. Retrieved on 2008-09-21. ^ Yang, Xiufeng; Haas, Kevin A.; Fritz, Hermann M. (1 July 2013). "Theoretical Assessment of Ocean Current Energy Potential for the Gulf Stream System" (PDF). Marine Technology Society Journal. 47 (4): 101–112. doi:10.4031/MTSJ.47.4.3. Archived from the original (PDF) on 2019-02-03. ^ The Institute for Environmental Research & Eductation. Tidal.pdf Archived 2010-10-11 at the Wayback Machine Retrieved on 2010-07-28. ^ Jeremy Elton Jacquot. Gulf Stream's Tidal Energy Could Provide Up to a Third of Florida's Power. Retrieved on 2008-09-21.